When a novel includes a crumbling estate, an inheritance, a mystery and a dark secret then I've got to read it and The House Between Tides by Sarah Maine has it all. Set in Scotland, the landscape is truly the main character in this novel. It's wild and atmospheric and you can almost feel the wind in your hair, lick the salt spray from your lips and hear the squawk of the birds in the air. Unfolding in dual time frames, we learn the present story from Hetty Deveraux (2010) and the past from Beatrice in the early 1900s. I preferred the chapters from Beatrice's point of view, as I found Hetty to be a real push over. I was often frustrated by her actions and was desperate for her to make a stand but it works for the novel. The mystery unfolded at a steady pace, but it wasn't a big surprise at the end. 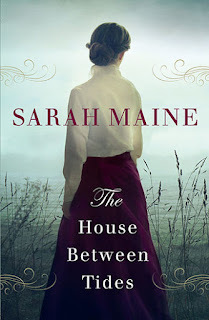 I would have preferred a little less focus on Blake's artwork and less about his passion for bird collecting, but all in all, The House Between Tides is a solid debut for Sarah Maine. Readers who enjoy Kate Morton's novels will feel at home with Sarah Maine.